North Atlantic right whales are enormous, slow swimming, baleen whales. Despite their heftiness, they are accomplished acrobats and are known to breach (leap above the water) and slap their flippers and tails against the water. 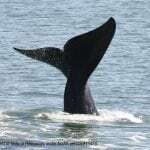 What do North Atlantic right whales look like? North Atlantic right whales are very big, rotund and mostly black; some have white blotches on their belly. They do not have a dorsal fin. Their flippers are broad and paddle-shaped and their tail flukes are wide. Right whales have enormous heads which are about one-third of the total body length. 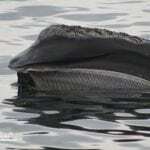 Inside their mouths are hundreds of baleen plates, each up to 3m (8ft) in length. Their jaws are strongly arched to accommodate their baleen. Right whales have large, white, bumpy growths on their heads, called callosities (from the word callus). The shape, size and position of callosities are unique on each whale’s head and so scientists can use these patterns to identify individuals. 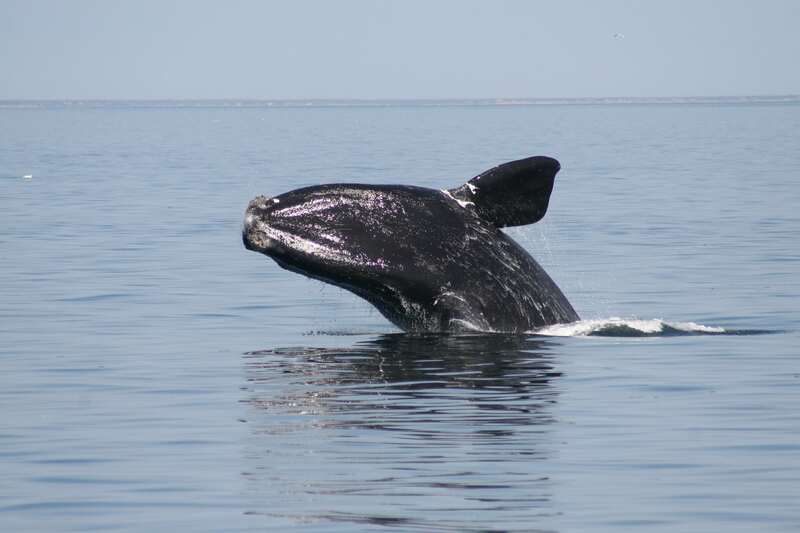 Right whales have a distinctive v-shaped blow (spout). What’s life like for a North Atlantic right whale? Unfortunately their lives are dangerous and difficult due to human threats. 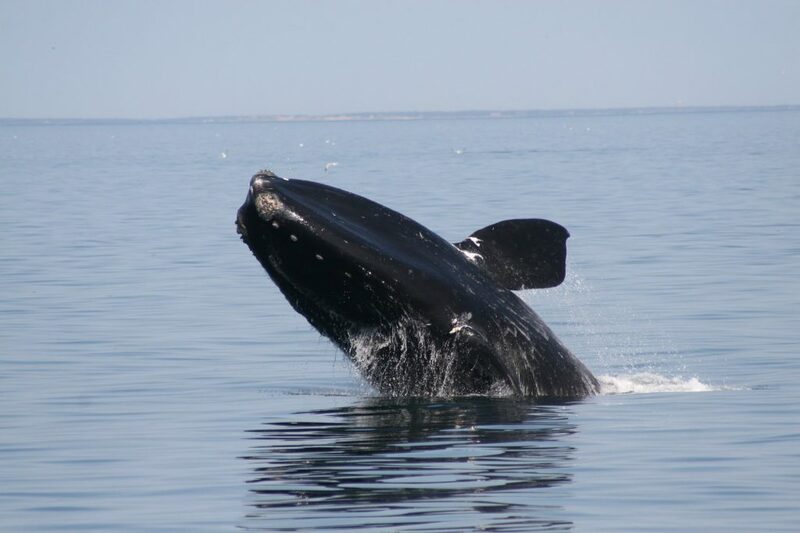 Historically, North Atlantic right whales migrated from their feeding grounds in cooler waters of the Gulf of Maine to their calving grounds off the southeast US. However, a changing climate has shifted their migratory travels into areas of intense human activity where conservation measures are not adequately in place, putting them at extreme risk. 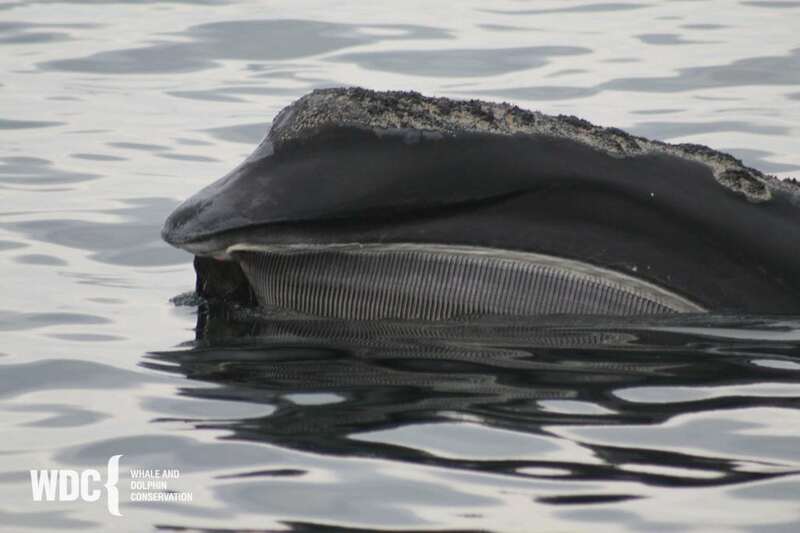 These whales are particularly susceptible to ship collisions and entanglements in fishing gear because they spend a considerable amount of time near the water’s surface. The social lives of North Atlantic right whales remain a mystery. While a whale might appear to be travelling or feeding alone, sound recordings indicate they are frequently in acoustic contact with others. North Atlantic right whales are baleen whales that feed entirely on zooplankton and their favourite types are large copepods which are about the size of a grain of rice. They also eat smaller copepods, krill and small invertebrates. The whales skim feed or graze; they swim slowly through large patches of copepods with their mouths open. The baleen plates in their mouths strain prey from seawater like a giant sieve. Scientists have found right whales can eat between 2200 and 5500 lbs (998 and 2495 kg) of food every day. 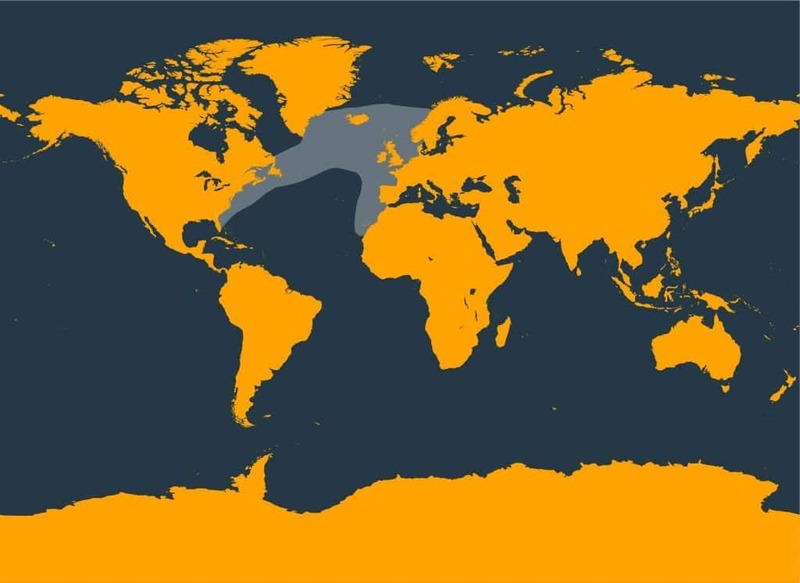 North Atlantic right whales used to be widespread throughout the North Atlantic. Centuries of hunting have drastically reduced their numbers to a tiny fraction of the original. Now, tragically, their sole remaining habitat is in the western North Atlantic, along the eastern US and Atlantic Canada, with a few individuals known to wander as far as Iceland, Norway, England and the Azores. Since 2010, right whales are more frequently found feeding in Canada’s Gulf of St. Lawrence during the summer months while their new winter habitats remain unknown. The only known right whale calving areas are in shallow, coastal waters in the southern parts of their range. Male right whales are unusual record breakers; they have the largest testicles in the world - each pair weighs about a tonne! WDC's team in North America are actively involved in efforts to protect the few remaining North Atlantic rights whales and their home waters. North Atlantic right whales were originally pushed to the brink of extinction due to commercial whaling. Whaling was banned (for them) in 1935 but these whales are still disappearing and will be gone forever without immediate protection from current human threats. Female North Atlantic right whales used to give birth every three to four years, now due to their stressful lives, they only give birth every four to 10 years. 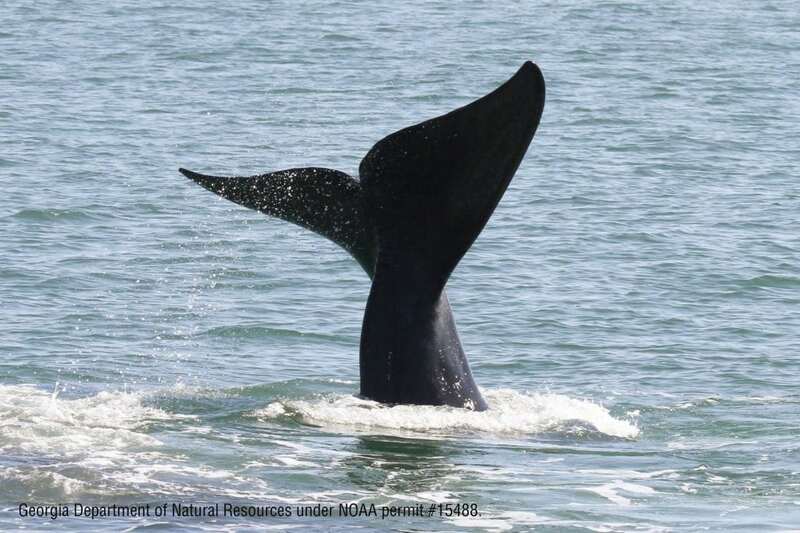 Right whales are particularly vulnerable to human threats because they live close to the busy coastlines of the eastern US and Atlantic Canada. Entanglements in tethered fishing gear, such as lobster and crab pots, are currently their single biggest threat. Whales who accidentally become entangled are destined to deteriorate from starvation or infections. A few of these unfortunate entangled whales are discovered by at sea and reported – some can be cut free with human help or manage to escape on their own; but these whales are weakened from their ordeal and females are unable to successfully sustain a pregnancy. The second biggest threat they face is being fatally hit by a boat; right whales feed, rest, socialize, and calve in areas dense with boat and shipping traffic. Right whales often fail to get out of the way of passing boats and their dark colouration and low profile make them difficult for people to spot at sea. Noise pollution and a changing climate also threaten these beleaguered whales. Right whales exposed to human-made sounds in the ocean, such as shipping noise, have been found to have high levels of stress hormones in their bodies. Stress hormones can reduce their ability to fight off illnesses and make it more difficult for females to get pregnant and successfully give birth. Fishing gear – Right whales are particularly vulnerable to human threats because they live close to the busy coastlines of the eastern US and Atlantic Canada. 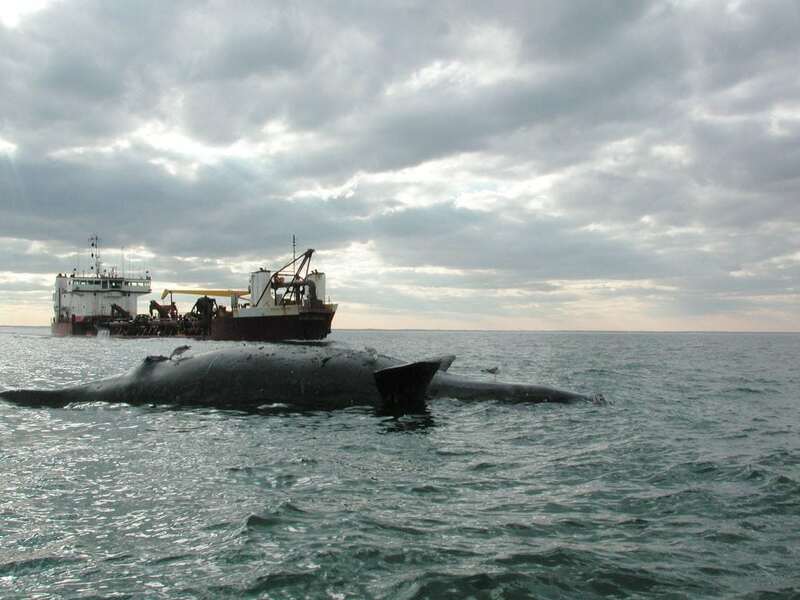 Vessel strikes – The second biggest threat they face is being fatally hit by a boat; right whales feed, rest, socialize, and calve in areas dense with boat and shipping traffic. 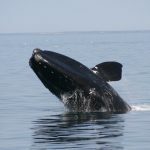 Pollution – Right whales exposed to human-made sounds in the ocean, such as shipping noise, have been found to have high levels of stress hormones in their bodies.